This branch is connected to Claudia's HENSON paternal lines. Claudia's 3-time-great paternal grandparents were Reuben FRALEY (1783? - after 1870) and Mary Polly FLANNERY (1792 - before 1840). They were both born in Virginia, but raised their children in Kentucky and Arkansas. Reuben was the son of Frederick FRALEY Sr who was born in 1725 in Mannweiller, Donnersbergkreis, Rheinland-Pfalz, Germany. He must have emigrated to the USA before about 1758 when he married Chloe in Rowan County North Carolina. We do not yet know for certain what Chloe's surname was. According to other researchers, they had 14 children including Reuben, before Frederick died in Dec 1792 in Castlewood, Russell County, Virginia. Frederick was a soldier in the Revoluntionary War. 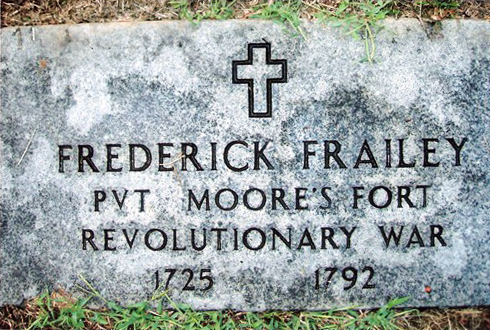 According to his gravestone, Frederick FRAILEY was a private at Moore's Fort. Although he died in North Carolina while away from home, he was buried in the Old Fraley Cemetery in Russell County Virginia, located on property he once owned. Reuben and Mary FRALEY's daughter Phoebe FRALEY was born 15 Feb 1828 in Kentucky. She married Jesse HENSON Sr probably before 1849 in Arkansas where their oldest son William was born. In 1870 they lived in Shepherd, Crawford County, Arkansas, and owned property. valued at $400. Of their 14 children, Claudia is descended from their third son John HENSON (1853 - 1935). Phoebe outlived her husband, dying in 1905, and was buried in Winslow, Washington County, Arkansas. Reuben FRALEY's wife Mary Polly FLANNERY was born about 1792 in Virginia. She was the daughter of Silas FLANARY (1742-1792) and Violet MARSHALL (1752-1817), likely one of their youngest as they were married in 1773 in Russell County Virginia. Silas was born in North Carolina, while Violet was born in Montgomery Virginia. Silas FLANARY's name appears on a memorial in Nickelsville, Scott County, Virginia, dedicated to Revolutionary War soldiers of the "EARLY WARS in honor of those who served". Both Silas and Violet were buried in Russell County Virginia. Silas's father Thomas Elkannah FLANARY (1722-1781) was born in Appalachian, North Carolina Colony. Between Oct 1759 and Jan 1760, he was on the pay list as a private in the Cherokee War, part of John Canty's Company under the command of Col. Richard Richardson. He lived in the Raleigh area of North Carolina in the 1770s. Thomas married Elizabeth BLUEBACK (1725-1810) of Virginia Colony. They both died in Illinois Territory. Thomas's male descendants have been linked through DNA testing to the Flannerys of Munster, Ireland. It is believed that Elizabeth BLUEBACK was the daughter of Jacob BLUBACK / BLUBAUGH (born 1698 in North Carolina) and Rebecca Hettie ZION (1702-1782), botn in Lee County Virginia. ​descendants of Phoebe FRALEY and Jesse HENSON Sr.